Aug 11 – Blessed John Henry Cardinal Newman, Cong. Orat., (1801-1890), Patron of the RCIA – Rite of Christian Initiation of Adults | ADULT CATECHESIS & CHRISTIAN RELIGIOUS LITERACY IN THE ROMAN CATHOLIC TRADITION: hosting ONLY True Christians!! !, or "How to think Catholic!!" 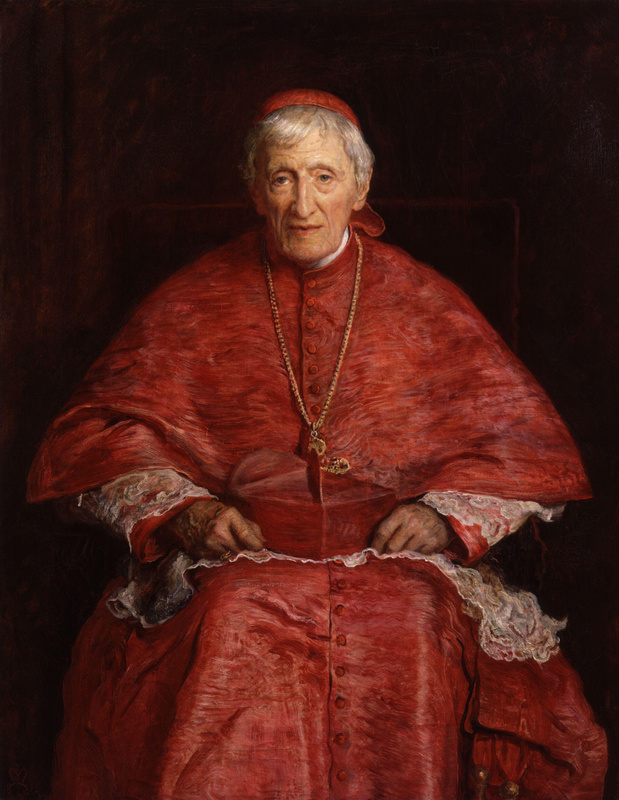 Cardinal John Henry Newman, CO, DD, by Sir John Everett Millais, 1881. Catholic education. Those words in many minds and places are synonymous. Deo gratias. The Church created the university system in medieval Europe, emerging from the training of monks and clerics, at the turn of the first millenia of Christianity to the second. Fides et ratio, faith and reason; there is no conflict in the Catholic mind, or at least there should not be. The intellect is a gift from God. Catholics believe its use is proper, expected by God, a form of praise of its Creator, and the proper formation of conscience is essential to the assent to Faith. The fundamental purpose of a university education is to seek and discover truth. Through this discovery, man comes to an understanding of God, himself, and the created order. Gaudium et veritate – the joy of truth. A much bandied about term these days in Catholic higher education is “Catholic identity”. Very, very, over simply put it “means” if you attended a Catholic institution of learning, could you tell? Really? How different is it attending Catholic U vs State U? Really. How and to what degree is debatable. And, IT IS! Trust me. John Henry Newman was born on 21st February, 1801, in London, the eldest son of a London banker. His family were ordinary church-going members of the established Anglican Church, without any strong religious tendencies, though the young John Henry did learn at an early age to take a great delight in the Bible. He was sent to Ealing School in 1808, and it was there, eight years later, that he underwent a profound religious conversion, which was to determine the rest of his life as a quest for spiritual perfection. In 1817 he entered Trinity College, Oxford, where he was a very successful student. Five years later he was elected to a coveted Fellowship of leading Oriel College. He was ordained and worked, first as a curate in the poor Oxford Parish of Saint Clement’s, and then, from 1828, as Vicar of the University Church of Saint Mary the Virgin. There, his spiritual influence on parishioners and members of the University was truly enormous, particularly through his preaching, embodied in the Parochial and Plain Sermons. He worked as a College Tutor, and a little later began to research the first of his many theological works, “The Arians of the Fourth Century”. Newman was to be one of the foremost religious writers of his century. In 1833 he went on a tour of the Mediterranean with a friend who was in very poor health. While in Sicily Newman himself fell desperately ill with fever. On his recovery it struck him that God had spared him to perform a special task in England. On his return home he eagerly set about organizing what was to become known as the Oxford Movement. The Movement, which spread rapidly, was intended to combat three evils threatening the Church of England – spiritual stagnation, interference from the state, and doctrinal unorthodoxy. When studying the history of the early Christian Fathers in 1839, Newman received an unexpected shock, for it appeared that the position of his own Church bore a close resemblance to that of the early heretics. He was also worried when many of the Anglican Bishops denounced one of his works a few years later – some not just denouncing him, but also espousing erroneous positions themselves. He decided to retire partly from Oxford, and, joined by a few others a little later, he moved to quarters at the nearby hamlet of Littlemore. For three years he lived a strict religious life, praying for light and guidance. By 1845, as he was writing his Essay on the Development of Christian Doctrine, he saw his way clear, and on 9th October he was received into the Roman Catholic Church by Father, now Blessed, Dominic Barberi. He had at last found ‘the One True Fold of the Redeemer’. Conversion meant ostracism by friends and relatives. Undaunted, Newman set out for Rome to study for the priesthood. While there he became attracted by the idea of the Oratory – a Congregation of priests founded by Saint Philip Neri in the sixteenth century. He founded the first English Oratory at Maryvale, near Birmingham, in 1848, moving soon afterwards to Alcester Street, close to the town centre, where he converted a disused gin distillery into a chapel. They moved to a new and more permanent base in nearby Edgbaston three years later, and were engulfed by work among the poor Catholics of Birmingham, which was soon to become one of the new cities of the English Industrial Revolution. In 1851 the Bishops of Ireland decided that a separate University should be established for Catholics, and invited Newman to become its founder and first Rector. It was a demanding task for an older man, but despite the strain of fifty six crossings to and from Ireland in seven years, he succeeded in establishing what is known today as University College, Dublin. From this period dates the important work “The Idea of a University” on the nature and scope of education, and the role of the Church in the context of a university. When he returned to England, Newman faced a life of trials, as he was suspected and even resented by some in authority. Several projects which he took up, including a magazine for educated Catholics, a mission at Oxford, and a new translation of the Bible, met with rejection or failure. On the other hand, many of his publications in this period were well-received: the “Apologia pro Vita Sua” (1864), a biographical account of Newman’s conversion; the “Letter to the Duke of Norfolk” (1875), which considered the relationship between conscience and the authority of the Church; and the “Grammar of Assent” (1870), on human reasoning and the act of faith, which although not always well understood by his contemporaries, would become generally acknowledged as a major contribution to both philosophy and theology. I have my mission–I never may know it in this life, but I shall be told it in the next. –if, indeed, I fail, He can raise another, as He could make the stones children of Abraham. –still He knows what He is about.